Wild-caught Haddock fillets coated in buttery cracker crumbs. Take gourmet home tonight with our easy-to-prepare wild-caught Haddock fillets, expertly seasoned and coated in an irresistible layer of buttery cracker crumbs. 3. Bake 23-25 minutes total* Flip after 16 minutes. 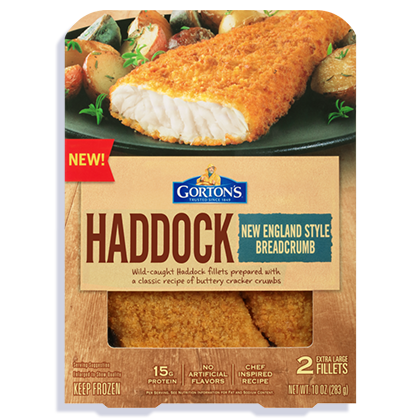 INGREDIENTS: Haddock fillets, breadcrumb coating, canola oil. Enriched bleached wheat flour (flour, niacin, iron, thiamin mononitrate, riboflavin, folic acid), canola oil, water, wheat flour, maltodextrin, yellow corn flour, vinegar, natural butter flavor, salt, sugar, nonfat milk, whey, cultured buttermilk, brown sugar, butterfat, baking powder (baking soda, sodium aluminum phosphate), dextrose, soybean oil, cheddar cheese (milk, cheese cultures, salt enzymes), colored with paprika, annatto, and turmeric extracts, yeast, caramel color, garlic powder, onion powder, palm oil, citric acid, butter (cream, salt), modified corn starch, sunflower oil.